You've always been an animal person. You have rambunctious golden retrievers roaming your house and at least two cats always snuggling on your lap, or, let's face it, on your computer keyboard. Though you love these little beasts with all your heart, that doesn't mean you enjoy having their fur all over your furniture. Protect your furniture with this quilted slip cover to keep your couches or chairs free of fur, paw prints, and the dust and dirt that animals bring in with them. Snag this deal today! Your furniture will thank you! 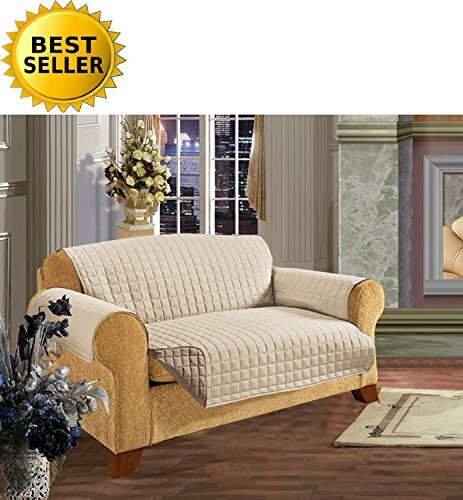 • Made from 100% polyester • Machine washable • Easily slips onto your furniture to block pet fur, odor, and dirt • Simply drape over furniture and secure in back with tie straps • Available in sizes Sofa, Chair, or Love Seat Size Guide: Chair - 65" x 75.5" Love seat - 88" x 75.5" Sofa - 110" x 75.5"
PREMIUM QUALITY FURNITURE PROTECT: This furniture protector shields and protects sofas, loveseats and chairs from spills, stains, wear and tear. It's perfect for homes with children and pets! PERFECT FIT: Our Sofa Furniture Protector measures 75.5 inches x 110 inches and fits most sofas 92 inches long; our Loveseat Furniture Protector measures 75.5 inches x 88 inches and fits most loveseats 70 inches long; and our Chair Furniture Protector measures 75.5 inches x 65 inches and fits most armchairs 38 inches long. COMFORTABE, STYLISH AND HIGH QUALITY: Beautiful Luxury Quilted Texture on both sides, lofty poly filled and ultimate comfort. Straps on the back to stay in place better and prevents Slipping off your couch ! MACHINE WASHABLE AND EASY TO WIPE DOWN: Keeps furniture safe from pets, stains, and spills. Water repellent finish, Machine washable ! NOTE : PRODUCT IS NOT RECEMMENDED FOR LEATHER COUCH !! If you have any questions about this product by Elegance Linen, contact us by completing and submitting the form below. If you are looking for a specif part number, please include it with your message.